Photos provided by Barb Heiss, Jerry Armellino, Kevin Slick, Charles Henson, Pat Gonzalez, Phil Smoot, Jeff Stoll, Steve & Maxine Wrzesien, Brian Keegan, John Santiago, Michael Joyner, Paul Speidel, Anna Marie Henson, Jim & Marian Clatterbaugh, Larry Tinkler, Cortlandt Hull, and others - thank you! Mark Statler (far right) and his Creepy Classics Chiller Band do the monster retro rock and roll for the Monster Bash 1950s sock hop. 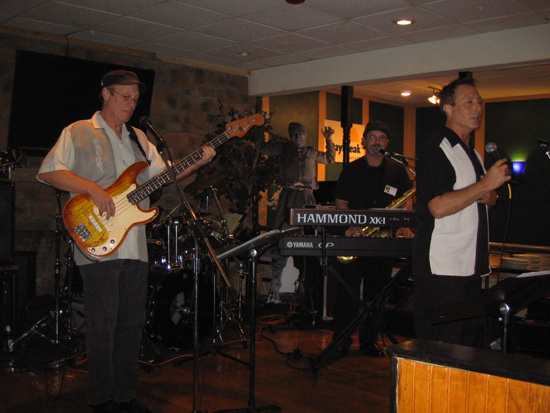 Notice that Larry Talbot was a background singer. Seek out Mark's monster music CD....it's greeeeat!. 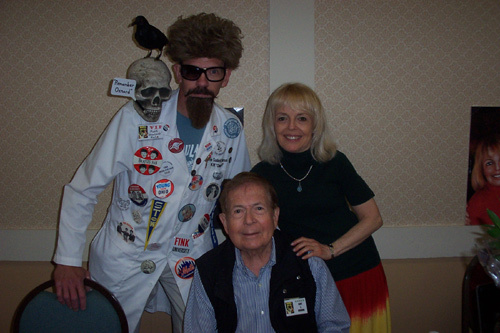 Sci-Fi Producer/Director Bert I. Gordon (Mr. Big) & Daughter Susan Gordon (Attack of The Puppet People) with Mark (Goulardi) Hale. 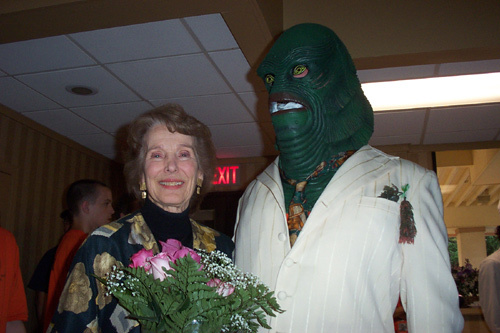 The beautiful Julie Adams meets up with ol' Gillman. Live music at the Bash Mass on Sunday morning. Early Sunday there is church service with Father Mike (a Bela Lugosi fan too). 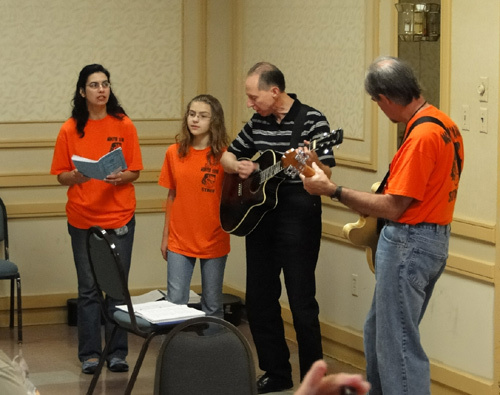 This year we had live music from Ursula Adams, Paisley Adams, Steven Thornton, and Kevin Slick. 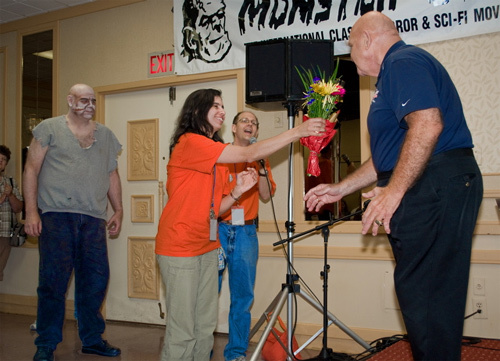 Big bald guys, flowers, and Monster Bash. Billy Gray gave both Dalton (left, next to Billy) and Dylan (right, next to Jimmy) one of his custom guitar picks. 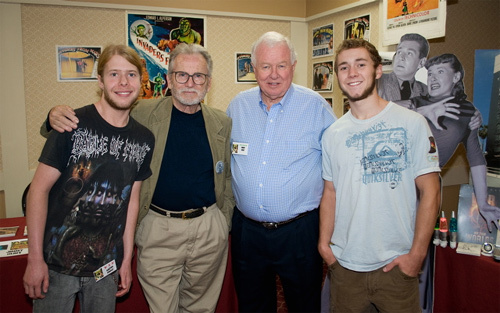 Both Billy Gray and Jimmy Hunt were really friendly and seemed to really appreciate everyone there! 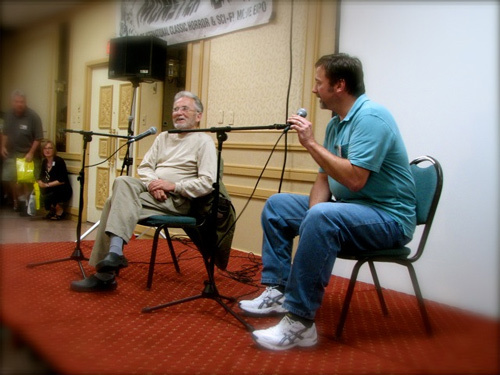 Richard Gordon (FIEND WITHOUT A FACE) and Richard Scrivani (Universal Historian and film collector)! 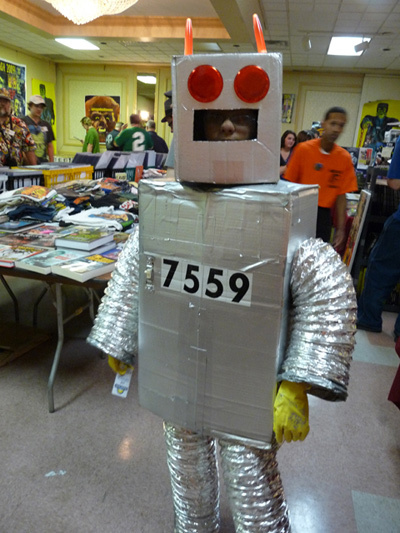 A small pint robot roamed the halls at Monster Bash. 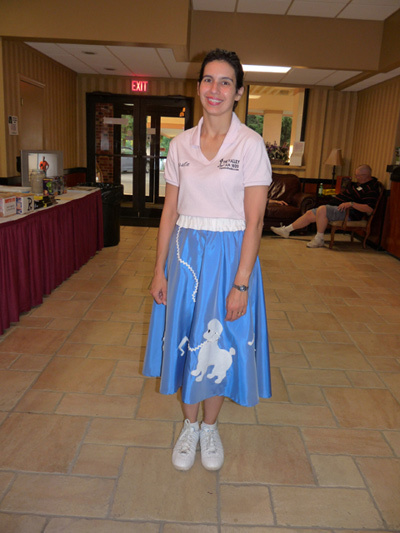 "Bride of Bash," Ursula Adams prepared for the Monster Bash sock hop. 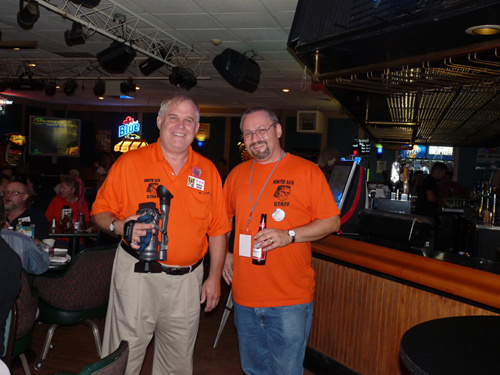 Charles Henson holds an impressive, expensive video camera and Bob Pellegrino holds...just another cheap beer. 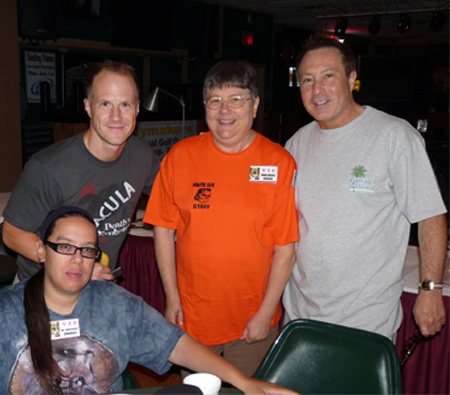 Pat "Ghoulchick" Gonzalez, Theron Statler, Anna Marie Henson, and Mark Statler. You don't find nicer people on the planet...then at Monster Bash. 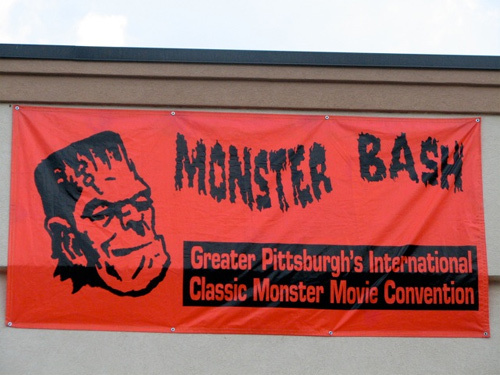 Tour the "Creepy Classics Room" with Pat "Ghoulchick" Gonzalez at Monster Bash. 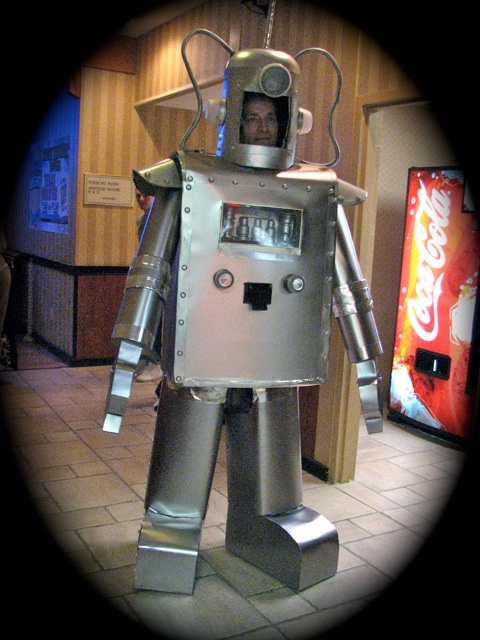 The Aztec Robot (Tod Spidle) clomped around Bash thanks to Daniel at Ballyhoo Productions. Like a proud flag, the giant Bash Banner was high atop the Days Conference Center. 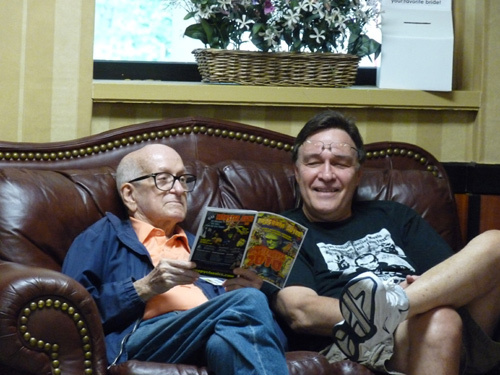 Billy Gray, interviewed by Scott Goettel for a Q&A. Blobbed! 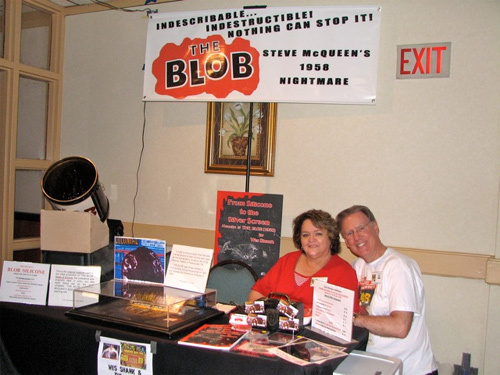 The original Blob prop (in can) with Judy and Wes Shank. 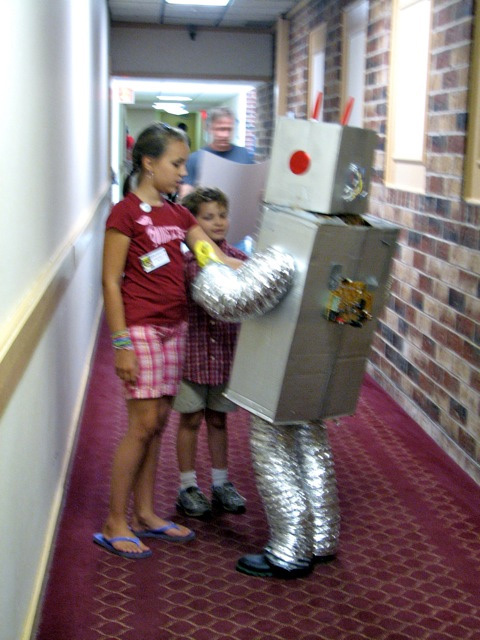 A mini-robot (Paisley Adams) greets earthings. Penny Dreadful and her furry friend waltz through the lobby. 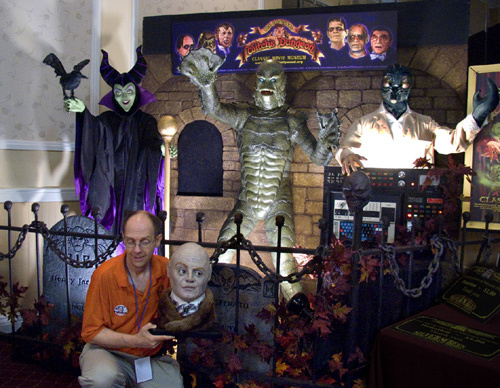 Ron Adams with Peter Lorre (Yes, the Lorre likeness IS the one on the right) at The Witch's Dungeon set-up at Bash. 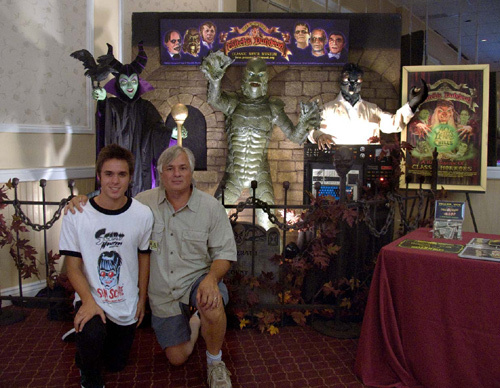 Here's Dylan and his dad - Dennis Druktenis of Scary Monsters at The Witch's Dungeon at Bash.